The above map of Route 66 is a mural on the Ramada in Kingman, Arizona. It is 50 feet long and was added in 2015. 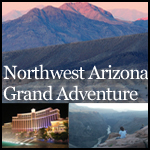 Kingman, Arizona is known as the Heart of Historic Route 66 and is one of the hidden treasures of Arizona. 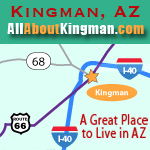 Kingman is located in Mohave County in Northwest Arizona. Kingman is right in the middle of the longest continuous stretch of Historic Route 66, also called the "Mother Road," remaining in the USA as it crosses Mohave County for 158 miles. Meteor City Trading Post was built in 1938 and boasted the Worlds Longest Map of Route 66 at over a 100 feet long. The last I heard it had fallen down and was in dis-repair. Built in 1939 the El Trovatore Motel in Kingman, Arizona displays their version of the Worlds longest Route 66 Map which is over 200 feet long. Holbrook, Arizona has their version which is about 300 feet long. The map is a cartoon ribbon of black paint as the highway and labels major (for Route 66) cities from Chicago to the west coast. As with most mural maps, don't trust scale, distance, or north-south orientation.